(Bloomberg) -- The S&P 500 has grown by $4 trillion since its December meltdown, and ETF investors are betting there may be more room to run. Investors poured more than $5.6B into the SPDR S&P 500 ETF Trust, known as SPY, last week, data compiled by Bloomberg show. The last time the world’s largest ETF saw inflows of this magnitude, U.S. stocks were on the cusp of a bear market in late 2018. But this time around, the cash infusion comes as the benchmark nears new highs. Although stocks are already up 16% this year, fueling a temptation to bail and pocket the profits, the appeal to remain invested persists as earnings season gets underway. Q1 should mark a bottom for the year, and Wall Street strategists are being forced to boost their year-end price targets or get left behind. 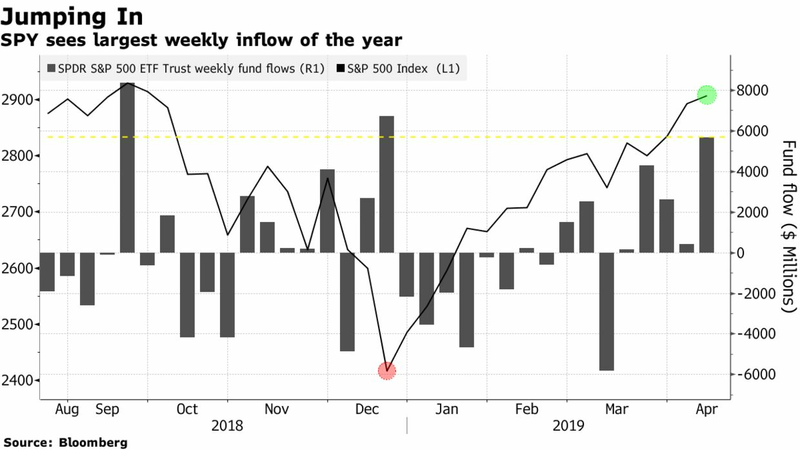 Growth stocks, which have helped fuel the record bull market, are also seeing renewed interest, capping three straight weeks of inflows in the period ending April 12, their longest streak since November, Bloomberg Intelligence data show. That puts growth funds on track for their best month of the year. “Moving forward, we are just seeing an earnings slowdown and things are likely to re-accelerate into the back half of 2019,” said Jeff Schulze, investment strategist at ClearBridge Investments, which has about $142 billion in assets under management.